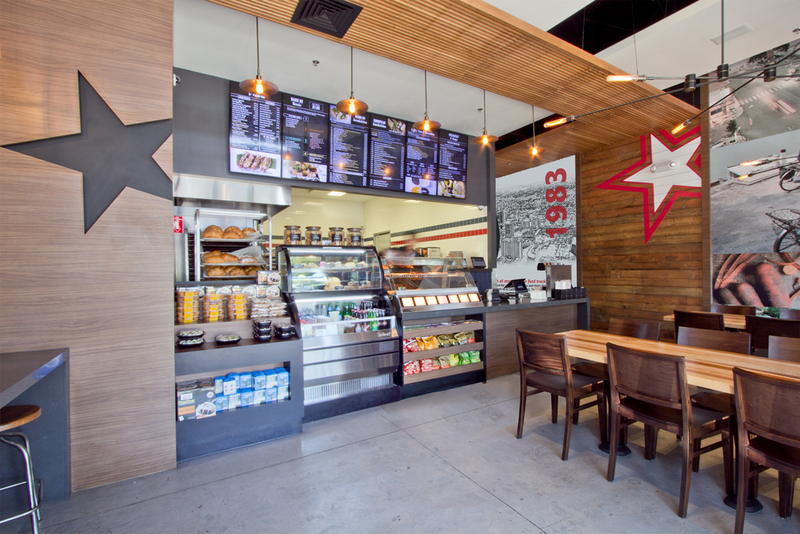 Lee’s introduces customers to a new upscale experience with a sophisticated materials palette, architectural elements with high impact and a streamlined layout to match their simplified menu. The design remains true to the Lee’s brand while not alienating their loyal customer base. The Cashwrap. Both beautiful and functional, the custom cashwrap seamlessly integrates equipment with woodwork in an elegant mix of black, walnut laminate, and quartz, accented by the branding with an inset logo-inspired star. 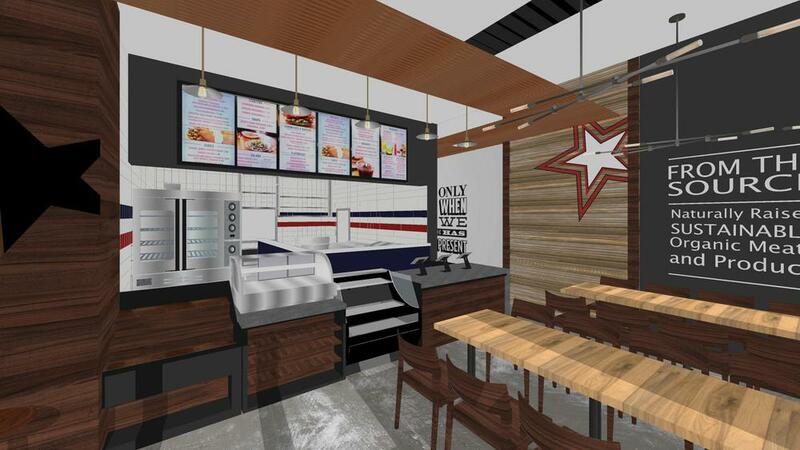 Functions include food and drink product displays, point of sale systems, a drink dispenser, storage, and cashier station. Display Kitchen The exposed kitchen preserves an open feeling in the small interior and allowing guests a deeper connection to watch their food being prepared. A reference to existing Lee’s locations, the kitchen includes the same logo inspired colored tiles in a new, modern stripe layout. Seating Maximized. 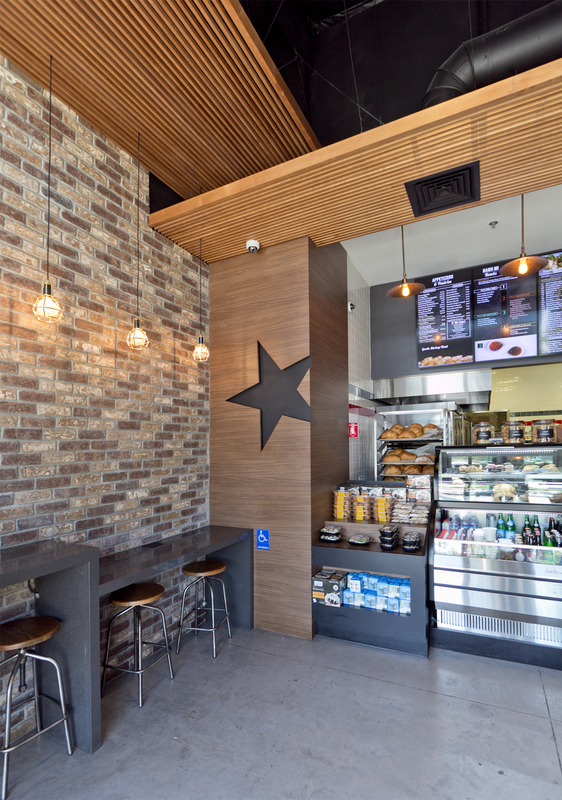 A quartz counter along the entry wall lined with brick veneer provides individual customers with a place to eat or work. The mixed species wood plank communal tables encourages socializing among guests and offers an efficient dining solution for small or large groups. We also made use of their outdoor real estate with a beautiful patio featuring a mix of tables and chairs, a banquette, and another dining counter in teak and aluminum.